I knit this outfit for a Knit-a-Long in my Ravelry.com group, American Girl Knitters. I just completed it on 7 March 2010! I do not own an American Girl doll yet but it fit my doll I call Betsy. I do not have grandchildren at this time but I do have two nieces with American Girl dolls. There is still a little snow on the ground here in northern Kentucky so it was a perfect opportunity to take a picture of Betsy and her new outfit. She loves it! I had used Maulfrid Gausel's pattern No 23, Kirsten's Ski Outfit to knit the outfit. A very lovely outfit!!! I have this pattern, also, but have not done any of them yet!!! I am going to have to get going!! This has come out lovely! I guess you have a good time working within this Ravelry Knitting Group! I really admire the beautiful work you did on this outfit. Although I haven't worked with this pattern yet, the experience you shared on Ravelry will be of great help when I get started on it. I love those shades of blue! 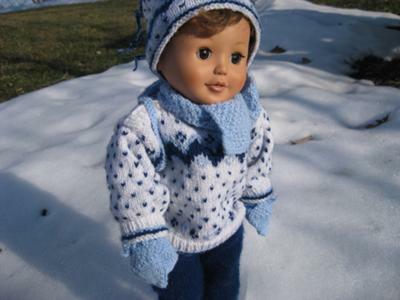 Your doll looks so good in her ski outfit in the snow.The perfect scene to show off her clothes. I'm still loving your picture! How great was that to finish knitting a ski outfit in time for a photo in snow? You did a lovely job on this and I'm impressed with your work.